I'm publishing this post on the very day it's due. I don't like to work this way, but I've been thwarted by some nightmare computer situations. So many, in fact, that simply the thought of developing one more workaround is enough to send me screaming into the street. It's not that I'm ignorant about computers. Quite the contrary. It's my affinity for technology that got me into trouble. They don't call me Granny Geek for nothing. I started using computers the moment they were the Next Big Thing and became available for consumers. I began with two: Apple 2e and another that was the portable version. I can't even remember the name by now. Both used the large floppy disks that held a teaspoon of information. Since my newest, latest, greatest upgrade to Windows 8.1 on my newest, latest, greatest monster of a computer I've had nothing but grief. I haven't been able to post properly to Type M. I get an error message immediately when I log in. I developed a work around that let me compose a new post, but the publish option has been grayed out and I haven't been able to schedule. Scheduling ahead can be very important to bloggers because I've learned not to count on internet connections always being available when I'm out of town. Rick Blechta is our outstanding blog administrator. He deals with all the Type M'ers questions immediately and is a very kind person. But I didn't want to pester him with this one. I put my problem on my ever growing list of stuff to straighten it out. I tackled this blog last night through Blogger help. Many persons were reporting the same problem. The recommended solution? Use a different browser other than Explorer. The site was working through issues with the new Explorer 9. Nine? I'm already using Explorer 11! No wonder I'm jammed up when I try to do things that used to work smoothly. Sure enough, when I accessed this blog through Google Chrome, everything was just peachy. Here's what I think is happening for those of us who naively believe that upgrades and new inventions will help up do our work. There are too many applications developed too quickly for one segment of the industry to integrate them all into their existing programs. Technology is moving at the speed of light. Technology used to be a tremendous blessing for writers. Anyone who used to peck out a 500 page manuscript on a typewriter understands that. The pain of correcting a page!! Heartbreakingly tedious. Now a number of my friends have told me that on-line marketing and all the opportunities for social media promotion is overwhelming. Doing a good job of keeping up is arduous enough, and doing a great job of keeping up requires a real stepper. My main concern is the toll all this nonsense takes on my writing time. Marketing is cutting into my writing time way too much. Marketing plus fixing computer nightmares is seriously depressing. So here's what I'm going to do. I'm by nature a scheduler. When I had small children I was fiercely protective of my writing time. I discovered no one, I mean no one, wanted me at 4:00 in the morning. I'm going back to my previous 5 days a week, 5 pages a day schedule. I used to stick to this routine no matter what. In the afternoon I'll put myself at the mercy of the real world. I'm going to devote an hour a day and not a moment longer to coordinate and fix integration among my too many sites and applications. I'm still cheerfully convinced that I can make technology work to make things better. In the meantime. . . I am — hopefully — nearing the end of the novel I’m writing. I did a lot (for me) of pre-writing on this one, not an outline, as such, but 3,000 words of notes. I don’t know exactly how the novel will end, but I know who wins, who loses, and what I want to have the reader experience at the novel’s conclusion. I swapped books with one of my heros, John Irving, a few weeks back. He read This One Day and sent a complimentary note, pointing to the ending — a real thrill for me, as you can imagine. As a reader, I like to read Whydunits; I don’t care how early I know who the antagonist is, but I enjoy learning the psychological motivations behind the crime. And I always want an ending I didn’t anticipate. As one would expect, I try to give readers the same thing in my own books. 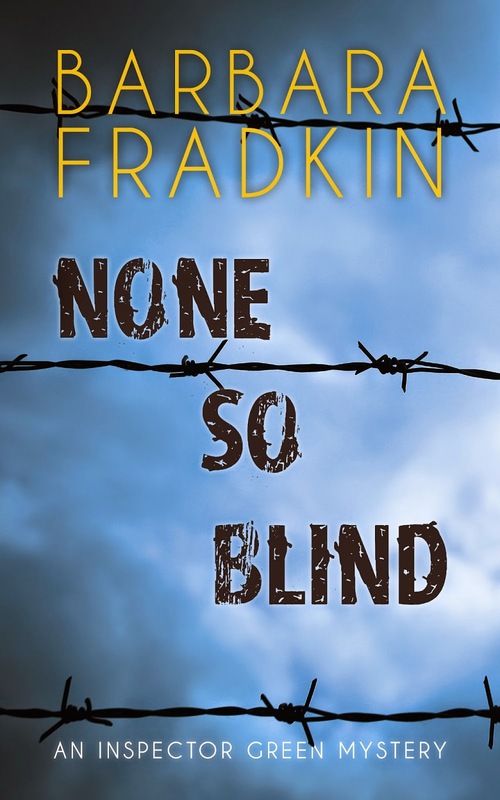 Which brings me to where I am now — 65,000 words into the 2015 novel featuring Peyton Cote, a U.S. Customs and Border Protection agent and a single mom. I know Who and Why. Now I’m working on the ending. I never usually know exactly how the book will end until I get there, which is wonderfully pleasing (I’m the story’s first reader) and gut-wrenching (what if I swing and miss?). My readers will demand an ending that they never saw coming but should have. It’s also an ending that I'll enjoy reading first. I’m supposed to be getting two graphic jobs out the door today (hence the tardiness of this post). With one late-arising change with one of them, I had to figure out how to fit the change in without knocking the whole hierarchy of the design into a cocked hat. For over an hour (with the clock ticking), I looked at the issue from every angle I could think of with no brilliant solution arising or even giving a whiff of its presence. Time to change task and let my subconscious work on it. As I often do when spinning my wheels, I looked over the local newspaper websites for interesting news articles. One of them I glanced at included a link to an article on another website. That led to a third website. In the righthand column of that page was a teaser for an article on a fourth website that looked very intriguing. About three paragraphs in, it hit me like the clichéd ton of bricks: the basis upon which I can build the first novel in the series I’ve been considering and actually writing scenes for (character development-type things). In actuality I’ve been waiting for some kind of inspiration to hit, sifting through promising plot ideas and either discarding them as too derivative or being more suited to later books in the series (and of course, keeping copious notes) – altogether a big assumption considering I don’t even have any publishing irons in the fire yet. So this idea with which I’ve been struck? Sorry, I can’t tell you (it’s that juicy), but I can say that it’s about a new type of crime. God bless those inventive criminals minds for making it easy on us struggling crime writers. Looking back, the whole situation is serendipitous in the extreme. I had drilled down four levels on the web to make my discovery. I wouldn’t even have been on the web if my client hadn’t requested that last-minute change. If I’d had a sudden inspiration on how to deal with the change, I wouldn’t have needed to distract myself. If it hadn’t been about to pour outside, I wouldn’t have even been in my studio, but out walking – my usual way un-conundrumming myself out of a problem. It’s early days yet, but my new plot idea seems like it will work perfectly with the construct I’ve been developing for the way my new characters will interact and I don’t have to force some other (inferior) plot idea onto them in order to begin writing the book. It’s as if a hundred doors have just opened. The stars lined up for me today in a huge way. Now if I could just push this job out the door, I could begin writing my magnum opus. Perhaps I should also send my client a nice bottle of single malt. Like Rick and Barbara, I also write for the Rapid Reads line of Orca Books. As they’ve explained to you, these are not novels, but novellas. Short (15 – 20,000 words) but (hopefully) gripping and exciting. I love writing these. To me, it’s an exercise in stripping a novel down to its basic essence. No subplots, no backstory (or very litte), no flashbacks, no multiple points of view. One story, told in a straightforward, linear style by one character over a short frame of time. Oh, and no subordinate clauses, compound sentences or words that send you scurrying for the dictionary. When I was in South Sudan for the first time two years ago, I realized that I wanted to write a book set there. It wouldn’t work for a Molly Smith, partly because that series is so closely associated with Trafalgar, British Columbia as well as her family, friends, and co-workers. I thought of a standalone novel, but I was unsure about having enough material from a three-week visit for an entire novel. In addition I felt that the setting of Juba, South Sudan, would require a darker novel than I am accustomed to writing. So it was perfect for a Rapid Reads novella. 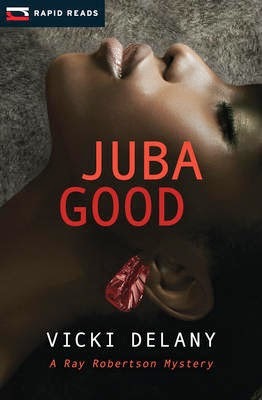 Juba Good has just been released. It is about an RCMP officer with the UN in South Sudan, working to train the South Sudanese police, and was inspired by Canadian police I met there. Africa is a wonderful, complex, amazing continent with a lot of problems. People are coming from all over the world to try to help. And people are coming from all over the world to take advantage of those problems for their own ends. And it is that which I want to explore in this book and others in the series. Juba, South Sudan. RCMP Sergeant Ray Robertson has spent eleven and a half months serving with the United Nations in the world’s newest country. He’s tired of the chaotic traffic and jostling crowds that fill the narrow streets. Tired of the choking red dust that blows into the capital from the desert. He can’t wait to get back to his wife and kids, and back to policing a world he understands. But when a young woman, the fourth in three weeks, is found dead at the side of a dusty road with a thin white ribbon wrapped tightly around her neck, Robertson fears that a serial killer is on the loose. In a country plagued by years of extreme poverty, civil war and the struggle to establish a functioning government, he realizes that it’s up to him and his Dinka partner, John Deng, to find the killer before they can strike again. The nice people at Orca then asked me to consider writing a Sgt. Ray Robertson series. At the moment, I don’t think I can write about South Sudan, not with all that's happening there right now. So instead, for his next assignment Ray will be off to Haiti. Look for A Hill Full of the Dead fall 2015. P.S. 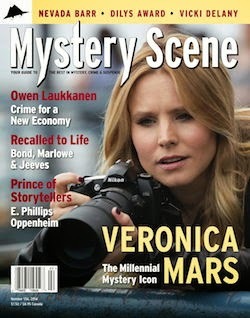 The current issue of Mystery Scene magazine has an article on Juba Good. Check it out! In gift shops and dollar stores here in the States, one can buy a slender booklet about the year one was born. These booklets have information such as the most popular songs that year and the cost of a loaf of bread or a gallon of gas. I have one for the year I was born. I bought it when I was picking up booklets for my series characters, Lizzie Stuart and John Quinn. Undoubtedly, I will buy one for my new series character, Hannah McCabe. I thought having these booklets on display would help to "ground" me because I am here in the present and the characters in my two series are in the recent past and the near future, respectively. I am constantly zipping back and forth between past and near future, and sometimes I don't know when anything happened. This is getting particularly complicated because my near-future series exist in a parallel universe and so some real life events in that past happened differently. For example, in The Red Queen Dies, the first book in the series, set in 2019, Elvis gave a farewell concert in Central Park in 2000. But the most intriguing aspect of all of this time-traveling was brought home to me earlier this week. I'm working on bios for the characters of my historical thriller set in 1939. What has become quite clear is that I can't simply begin with who these people are in 1939. They, like my characters in the two series, grew up in a world that shaped who they are at the moment when my story began. The difference is that with the characters in my series, I know their worlds. I have experienced or can imagine what they have seen or done. What I need to keep in mind about my series characters is when they were born and how that affects what they experienced. This is exactly what I need to do with the characters in the 1939 book, but it is an entirely different matter. Even though I think of myself as time-traveling, the closest I can come to experiencing what they experienced is to draw on the historical sources available to me. I can watch this movie and get some sense of what it was like to attend the fair in 1939. I can find other video of the crowds attending the fair and see the World's Fair buildings that are no longer there. But what I can't do when I'm creating my characters is feel and see and taste and touch what they did. I'm finding this incredibly frustrating, much more so then when I try to imagine the lives of my characters in my series. I think this is because I'm a crime historian. I occasionally teach a course on historical research methods. I know how to access archival sources. I know how to search for the museums and historical societies and other places that might have exhibits that will allow me to see the material objects that people made, bought, and used during this era. But what I'm encountering now in my fiction writing is the same yearning to step back in time that I always feel in my academic research and teaching. I'd like to walk down a street in 1900, attend Harry Thaw's trial for murdering Stanford White a few years later, be there in the streets of New York City as the troops are coming home at the end of World War I. In 1918, when the flu pandemic began, my character, Ella, who was born in Virginia in 1913, was five years old. I can go to my hometown in Virginia, the real place on which Gallagher, the town that Ella was born in (and that my series character, Lizzie Stuart and John Quinn live in nine decades later) is based. I can go through the public records and the local histories about the town. I can find letters and scrapbooks. I can talk to people who had relatives who lived through the pandemic. I can find out what it was like to be an adult or a child in Gallagher in 1918-1919. I can get some sense of what happened when Ella's baby brother became ill with the flu and died. I have no desire to live through the pandemic.Or the "Palmer Raids" in 1919, when the government was rounding up alleged radicals and anarchists. I don't want to be caught up in the race riots of that year. But -- as a historian observed about the New York City draft riots of 1863 -- to have only a few minutes to experience the sights and sounds and know what it was like. . . and then, of course, be snatched back to my comfortable armchair. My character, the FBI agent, gets his orders from J. Edgar Hoover in 1939. Hoover has a few conversations with FDR about political enemies and non-interventionists. I don't need to be there for that. But I would like to have been there when my FBI agent was growing up in the 1920s, when he was riding along in the truck with his older brother who had been hired by some bootleggers. I wish I could follow him into a speakeasy. And then there is Ella, my young African American schoolteacher. I can imagine her schoolroom on a winter day, with one of the boys bringing in coal for the potbellied stove in the middle of the room. I can imagine her emotions as she has her students recite from their battered, hand-me down textbooks. I can imagine her trepidation and her excitement as she buys a train ticket, setting off on her journey to see her twin brother who lives in NYC. I can imagine some of this, but I am still struggling to get into her skin -- her brown skin in 1939. A different experience at a visceral level from mine of being African American and middle-class in 2014. I need to spend a day listening to 1939 radio instead of searching on the internet. I need to step away from my devices and imagine myself into the worlds of Ella and my sleeping car porter protagonist and my wealthy villain and co-conspirators. This is why I have a plot outline, but I am not ready to write. This summer, I am into immersion -- going as deep as I can into the era from 1900-1939. Luckily, this is my historical era in my academic research. But writing an academic book about crime and justice during the Prohibition requires "sociological imagination" rather than the neurons than one uses in writing fiction. Right about now, I'd would really love to be sitting at a table in the Cotton Club. Of course, if I said that to my black poet-radical in 1939, he would remind me with a look of disdain that I would not have been allowed to sit at a table in the Cotton Club. Black performers at that club in Harlem, yes. Black patrons sitting at the tables, no. Race/ethnicity, gender, class -- what happens when my young black woman from Gallagher, Virginia gets off the train in New York City? How does she get where she needs to go? Who tells her where to find a room? My wealthy white male industrialist travels by train from Georgia to New York City. He makes the trip often during the months leading up to the World's Fair. I need to experience riding a train, arriving in New York, and moving about the city from these very different points of view. I need to think and imagine a whole lot more before I can start writing. I need to step back into 1939. I need to see 1939 through the eyes of these diverse characters who were coming of age as the world was changing more rapidly than anyone could have imagined. Like my Ella, my character, I am experiencing both trepidation and excitement. Can I do it? Got to try. But it's going to be the most challenging assignment I have ever given myself. 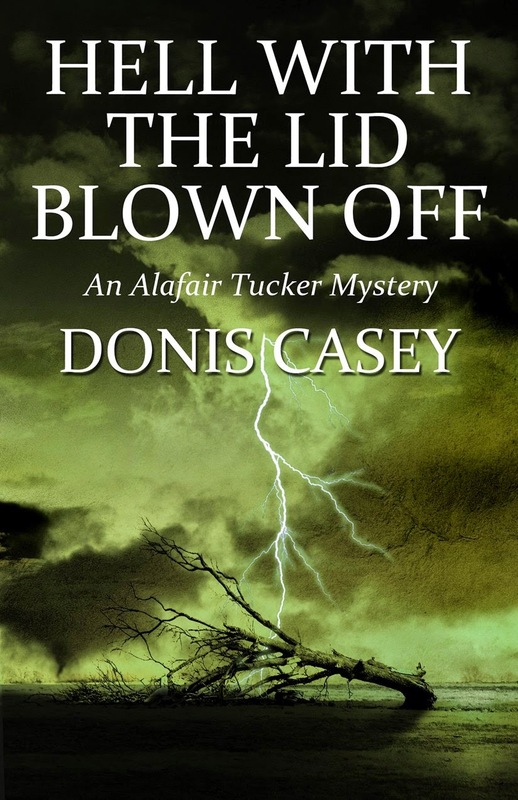 My seventh Alafair Tucker novel, Hell With the Lid Blown Off, is set to launch in two weeks. You know what that means. It's time to get cracking on the next book. For instance, rather than work on the manuscript I've just spent the last fifteen minutes naming my rock band. I was listening to Death Cab for Cutie when it occurred to me that they must have come up with their name by throwing darts at a dictionary. "Donis," I say to myself, "if you close your eyes and stab your pencil point at random spots on the newspaper, surely you could come up with your own effective band moniker." I've done this several times and have a whole pile of likely band names in case anyone is looking. Here are the latest, my four, three, two, and one word band names, in just the order random chance dictated. I discovered several books ago that if I’m going to be able to power through the pain of a first draft, I have to set myself a rigid writing schedule. This is difficult for me, since I’m not by nature a disciplined person. I don’t enjoy forcing myself to put words on the page, whether I’m feeling inspired at that moment or not. I’m always anxious and unhappy for much of a first draft. Why, I ask myself, isn’t this better? It seemed like such a good idea when it was still in my head. Why do I put myself through it? I’m never sure I can pull it off, no matter how many times I’ve pulled it off before. But then there are those days, even while you’re struggling with the first draft, when you do hit the perfect note, or compose a passage so beautiful and true that it brings tears to your eyes. Ray Bradbury spoke truth when he said that real success comes when you begin to write from the inside, and not from the outside. Besides, once the first draft is finished and you’re on to the second and third and however many more, world without end, it all starts to come together and you realize with a start that you’ve got something. Maybe that old mojo is working after all! Barbara here. One of the secrets of a successful mystery series is the appeal of its main sleuth. Readers may read one book for the power of its story but they return to read the next one because they have come to care about the characters. Experienced writers think long and hard about the qualities they want when they start to flesh out a new series character. Does the character have sufficient complexity, conflict and room to grow over the course of several books? Can she pique the interest of readers and maintain enough appeal over a long-term relationship? Can readers identify with her and with her particular struggles, foibles and hopes? In short, will readers care about him? It's an open debate whether the series lead has to be genuinely likeable, but readers have to find some reason to care about his journey. At a minimum, he has to be intriguing and redeemable, and give the readers something to root for. Perhaps even more important, do you the writer care about her? You'd better; you will be spending more time with her than with your own real loved ones – four to five hours a day for months and possibly years if the series continues. You will probably have more conversations, arguments, break-ups and make-ups than with anyone else. Chances are, if you grow sick of her, readers will too. Striking the right balance between appealing, perhaps even inspirational, characters on the one hand and superhuman ones on the other is another challenge. Perfection is not likeable. It's not human. It's more difficult to root for and identify with someone who's always brilliant, brave, and strong. Who always knows what to do. That magic balance is trickier to achieve than you think, and sub genres differ in what constitutes the ideal mix. Cozies want likeable, clean-living sleuths, PIs learn towards the anti-hero, and police stories generally reflect the flaws and mixed heroism of real life. Luckily, writing is not static and it's possible– indeed, essential– to shape and refine a series character over successive books as you discover more about them. When I wrote my first Inspector Green novel fifteen years ago, I knew none of this. I thought through none of this. I never thought the book would be the start of a series; I didn't look much beyond finishing the thing. I dreamed up a character that interested me, started writing, and got to know him as I threw plot twists at him. Michael Green is far from perfect, and there have certainly been readers who don't like him at all, but he has grown over the course of ten books into a substantial, complex, flawed but essentially decent man who rarely wavers from his commitment to justice for victims. By luck, and also by allowing him to grow over the series, I believe I have largely succeeded in finding that balance. I embarked on the Cedric O'Toole Rapid Reads mysteries a much more savvy writer, and since I had a particular task and target audience in mind (the emerging or "reluctant" reader), I tailored the character of Cedric more deliberately to appeal to that target. I wanted Cedric to be a regular guy they could relate to, facing struggles they faced every day. A quiet, unsung hero they could root for. Over the course of three books, his simple character has deepened and his struggles have grown more complex. I enjoy spending time with Cedric, and I believe he still has a lot of room to grow in future books. I am now thinking about yet another series character, and this time I am taking the time to get to know her quite well, inside my own head, before I take her on any specific adventures. I want to make sure that she has the complex, layered, interesting personality to keep me and readers engaged. I want to be sure I like her enough, her dreams are bold enough and her hopes noble enough that we will root for her. I know I will discover the best of her during the writing process itself, and she will evolve over time as she faces new challenges. No character emerges fully formed from the writer's character sketches. That way lies stagnation and contrivance. But I am now trying for a new balance, between deliberate planning and free-wheeling discovery. One more post on "authoring"
But this post isn’t about blatant self-promotion. I believe book launches are very important things for authors to do. First and foremost, it’s not easy to get a book published. Truthfully, it’s never been easy, but these days it’s way worse. So holding an actual paper book in your hand is something worth celebrating, isn’t it? My publisher is, unfortunately, is way on the other side of Canada, but I know they’d show up if they could, so tonight it’s up to me to carry both the author flag and the publisher one. Secondarily, though, a writer has to work darn hard and put in many lonely hours to craft a story. The Boom Room, being a novella, is only 147 pages, but due to its nature (crafted with an eye towards those with challenges in English language literacy), it takes a lot of work. My marching orders from Orca conclude with this: “And above all, it must be a good story, well told.” To do that (making the story readable to those who don’t read well and for folks whose reading skills are quite fine) takes a lot of time and careful consideration. If the book happens to be a full-length one, then the writer has put even more hours in. So, after expending all that time and effort, shouldn’t you throw a big party to celebrate the results? My launch this evening will be a smallish affair. Most launches, we have live music. In the past, I’ve dragged out the old mellotron to personally deafen launch attendees with some classic progressive rock (think Nights in White Satin). Last time out, for The Fallen One, two opera-singing friends, Anna Bateman and Emilio Fina came out and sang some arias to recorded orchestral soundtracks. We even made anyone who’d join in help out in the drinking chorus from the first act of La Traviata. It was a magical evening – and held at Toronto’s storied Arts & Letters Club. Tonight will be music-less since I really didn’t want a punk rock since that’s the music of the band in this story. Perhaps my favourite launch was for A Case of You. I used the upstairs of a somewhat infamous bar in the east end, and invited a number of musicians I know and have worked with to come down and play. Jazz being the musical background of this story, we played that. Part of my contribution was a keyboard/vocal duet with Nina Richmond the very fine vocalist from the big band in which I play and, of course, we did A Case of You done as a ballad in a paraphrase from a later Joni Mitchell album. So you see, launches can be fun as well as good promotion. They take work and a ton of networking to try to get enough people to come out, but you’ve done a lot of work to get this far, shouldn’t you at least be celebrating that? At best, you may be able to get someone from the media to attend, and that’s always a wonderful thing. 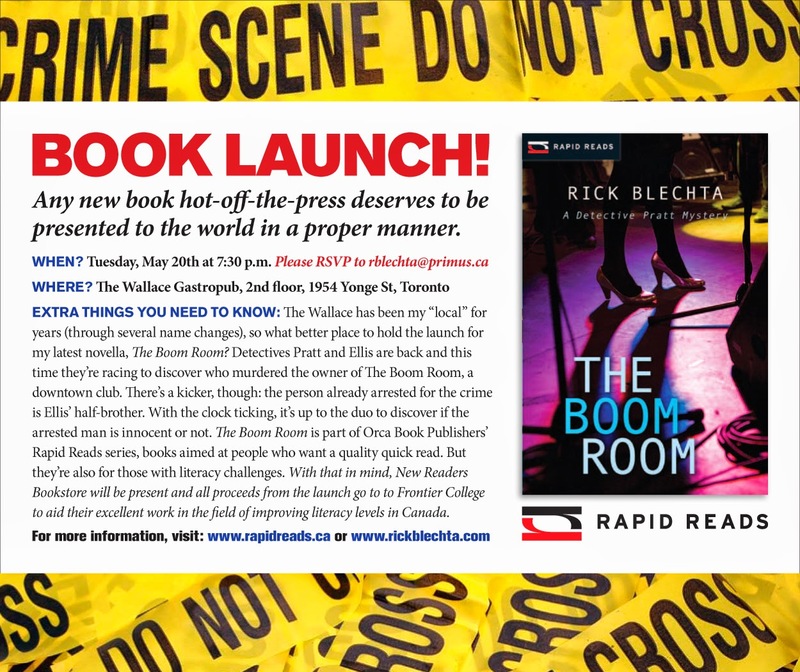 If you can’t make the launch but would like to support the cause of literacy in Canada, you can order a copy of The Boom Room directly from New Readers Bookstore. They’re the retail part of Frontier College and they’ll be very glad to help you. 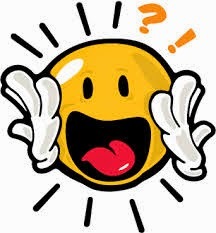 I'm just at the stage in the first draft of the new book when I've stopped introducing fresh developments, new red herrings, extra plot complications, to keep the reader baffled. That's been the fun bit. Now there's no escape. I'm having to confront all the problems I've created and sort them out into some kind of satisfying conclusion. The image of a person who has started varnishing the floor with gay abandon only to discover they have painted themselves into a corner is vividly in my mind. There is a sort of cold feeling in the pit of my stomach that maybe this time I've been so clever in devising the crime that I've actually managed to create the perfect murder that can't be solved, even by its creator. I felt huge sympathy when reading a book by one of my favourite crime writers (whom I wouldn't dream of naming). She is hugely and deservedly successful; the novels are original and always clever as well as being utterly gripping. In this one book, though, when it got to the final stages it rather lost its way and Chapter 25, where the denouement began, was uncharacteristically muddled and unconvincing. Then I knew what had happened. She had, indeed, been too clever for her own good and when it came to tying up the ends she just couldn't think how to do it. The editorial team must have come in with their suggestions and the result - Well, they do say that a camel is just a horse that was designed by a committee. So that's really not an option. I'm on my own and I'm scared about it. Denouement - it means literally 'unknotting'. What if I pull out one thread and the whole thing completely unravels? I'm telling myself I've done it before, that every author goes through this sort of trauma and there's probably a special long German word for it. But then I think maybe there isn't. Maybe it's just me. Before now I've been lucky but it's caught up with me at last; I'm going to be punished for not plotting precisely and working out how it will finish before I even start. I'm not looking forward to the next spell. And the worst thing is that now there's this idea shimmering on my mental horizon, the new plot that will be so much better, so easy to write, throwing up no problems at all ... If only I could finish this one and get started. This weekend on Type M for Murder, I am pleased to welcome my good friend and colleague R.J. Harlick. Not only is Robin the author of the terrific Meg Harris mysteries, set in the wilderness of west Quebec, but for the past two years she has been president of Crime Writers of Canada, a demanding but fulfilling job serving the interests and needs of Canadian crime writers from coast to coast. Robin weaves her commitment to social issues through her entertaining and informative series, and here she tells us about her latest book, hot off the presses. We fiction writers are in the business of telling stories and we do it using words. Our love of words and playing with them is likely what induced us to become writers. It is rather neat to create an imaginary world completely with words. But there is more than one way to tell a story. Graphic novels and comic books come to mind, where illustrations take the place of words, except for the odd bit of bubble dialogue. Of course the medium of film is another form of storytelling. A work of art can also tell a story, but usually it is just one moment in the story. I mustn’t forget the oral tradition of storytelling that began long before the spoken words were transformed into written words. These stories were meant to be passed on from one generation to the next. They were also spread in the form of ballads often sung by wandering minstrels. While I was doing research for my latest Meg Harris mystery, Silver Totem of Shame, I discovered another form of story telling. It happened while I was exploring an ancient Haida village site on Haida Gwaii. I was trying to make out a carving on one of the few eroded totem poles still standing, when a Haida watchman approached and started explaining its significance. This guardian of the long abandoned village thought the barely discernable vertical lines at the base of the pole represented a picket fence that had been carved into the pole to record the visit of the pole’s owner to Fort Victoria. He went on to explain that many of these poles were intended to tell a story about the life of the chief who had commissioned it. Pointing at the toothy grin of another carving, he suggested that the killer whale likely wasn’t smiling because he’d just eaten the chief of a rival clan, but more likely was one of the crests identifying the clan to which the pole’s owner belonged. And so my Haida carver was born. As Meg sets out to unravel the murder of a young Haida carver, I interweave another story. A totem pole carver sets out to carve a story of shame and betrayal that reaches back to when the Haida ruled the seas. R.J. Harlick is the author of the acclaimed Meg Harris mystery series set in the Canadian wilderness. Silver Totem of Shame is the 6th book in the series. www.rjharlick.ca. I'm in a bit of a muddle. I'm committed to too much writing in too little time. It's moderately crazy anyway, to be doing academic writing in the middle of a mystery. The first time I bit off more than I can chew was when I was eleven years old. I was an avid 4-Her and a member of the Seekers Not Slackers 4-H club. The highlight of the club year was enrolling in projects. They were astonishingly varied. Every child could find a niche. So one year, in addition to my usual sewing and food projects, I decided to take gardening, and plant strawberries. It was to be the biggest, gol-durned bestest strawberry patch the county had every seen. I certainly had the first part right. It was enormous. Big enough to stave off any Vitamin C deficiency in the third world. We noble, conscientious 4-Hers were not allowed to accept help. Preparing the ground was hard enough, but inserting all those precious little plants was torture for even young backs. The worst was yet to come. I had to hand carry buckets of water. Every. Single. Day. It was hot, The metal handles dug ridges in my hands. The plants were bent on dying. I was determined to save them. It was a matter of honor. I was quite bitter that my parents didn't recuse me. Late summer, the entire club formed a convoy and drove from farm to farm to view the members' projects. We admired all manner of livestock; calves, pigs, horses, chickens, ducks, dogs, sheep, and goats. Some members showed off their woodworking skills. With luck, those enrolled in cooking had thoughtfully baked a little treat. At last the club came to our farm and viewed my huge strawberry patch. It was respectable, but nothing special. It looked droopy and some plants had died despite my best efforts. It had ruined my summer, but I didn't have to suffer the humiliation of a failed project. The whole 4-H experience was highly educational. We learned to give talks, to present ourselves well, to assimilate failures, to be graceful losers and winners, to calculate time and energy, to pull together as a group, and most of all, we learned to think. Recently I asked a new mystery writer who had a great debut novel if she would be interested doing a guest post on Type M. She calmly said she didn't have the time. She was writing her next book and didn't blog when she was actively writing. Smart, smart lady. I envy her ability to think, to plan, to calculate time and cost. I keep forgetting the strawberry patch experience and blithely assume I can do it all. Most of the time I sort of can, but the cost cancels the pride of achievement and the nagging sense that I could have done much, much better on projects. My 2015 book was due May 1. It will probably be 400 single-spaced manuscript pages (100,000 words) when I’m finished. I’m 250 pages into it. Only. 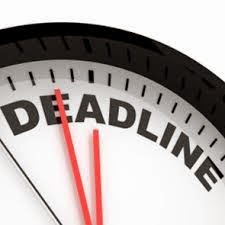 Yes, I’m confessing: For the first time in my career (seven books), I missed a deadline. I’m working as fast as I can to complete the book, and I think it’ll be worth the wait. I believe it’s better than the first book in the series (Bitter Crossing, Aug. 2014). The writing process has been more or less the same as all of my books: I write a brief synopsis, a few character sketches, and even a few plot points – not an outline, but five or six pages sketching out what is compelling about each character and his or her backstory, which will serve as motivational material for my eventual plotline. I made some good headway, writing a hundred pages in the fall. Then, as with all of my books, the waters muddied. So I backtracked, re-reading the whole book, start to finish – which takes a week – in order to locate a thread. And then I continued on. Add to my disjointed composition process the fact that we moved, and I started a new job that demanded my full attention 15 hours a day, and it’s not hard to see where I fell off schedule. But now I’ve settled in, my family has adjusted, and the book is going well. Still, I don’t feel very good about missing the deadline. That’s enough chit-chat. I’m going back to the book. I’m shooting for July 4. Cross your fingers for me. It’s been a whirlwind past couple of weeks starting with a crazy trip to Malice in Bethesda, Maryland via New York, then, on to Los Angeles to work my “real” job—which is what my mum calls my day job. With the release of Murder at Honeychurch Hall just yesterday (!) I have written no less than twenty-one blogs for all kinds of guest posts, a Virtual Blog Tour which is still going on … and a couple of magazine articles. I can honestly say, I’ve done the best I can and now, the success of the book is in the hands of the Universe. As a writer, I must admit I have always been selfishly thinking about what I’d like out of a relationship with my agent, editor or publicist. My top three qualities would include a timely response to my emails, the occasional phone call to see if I’m still alive—and best of all—cocktails, lunch or a dinner date! I do go out of my way to meet my agent and editor as much as possible (and not just at conferences) and I honestly believe that meeting face-to-face makes a huge difference which is why I stopped in New York recently. It's also a good reason to keep my day job because I can afford to do that. *Marcia's advice is to do the best you can then let it go and write the next book. I found the list of qualities really helpful and realized I had been guilty of a few of the less savory ones myself so when it comes to threatening to quit writing, I’ll make sure to keep my insecurities to myself … oh wait! That's what my husband is for ... and that's why he's a Saint! A number of years ago, I had a very talented French horn student to whom I was giving private lessons at the Royal Conservatory. Only problem was, the lad didn’t practise very much. In fact, I got the feeling he was coming in and basically sight-reading his assigned etudes and pieces. Because he was so talented, he could almost pull it off, but with his teacher also being an experienced lesson faker, I could spot what was going on. So I decided to confront the issue and tell him if he didn’t change his tune (sorry for that! ), he’d have to find a new teacher because I wasn’t going to waste my time and his parents’ money listening to him sight-read at his lessons. I laid out exactly what I expected for his next lesson, and if it wasn’t done, he would be shown the door. I didn’t know whether to hug him or slug him. But that student’s observation is worth thinking about when a writer puts on his/her author’s hat. When you’re doing the authoring thing, it really has nothing to do with writing in so many ways. I think of it this way: you’re being an entertainer, not a writer. Sure, you’re talking about writing, but you can’t behave the same way you would when you’re in your cold, dark garret, warming your hands on a guttering candle so that you can hold your pen and scribble your immortal prose. You have to dress differently. You have to speak differently. The idea with doing personal appearances can be boiled down to one thing: communicating effectively. That means – unless you’ve recently joined Toastmasters (not a bad idea if you’re uncomfortable about speaking in public) – speaking a different way than you normally do. You have to slow down, enunciate clearly, get rid of “ums”, “ahs” and all other words you might tend to use as crutches – and above all, speak up! Don’t sound like you’re in a rush to get this done – even if you are. You’re entertaining, remember? A recorder (tape or digital) is your friend. Regardless of what you may think upon hearing your dulcet tones played back, these darn things don’t lie. This is what you sound like. I always have the mental image in my mind that I’m an actor (don’t laugh), and that I’m in a large hall. I want people to hear me all the way to the back. If I’ve got a mic, great. If I don’t, I’ll have to handle it the old-fashioned way: by projecting. One last thing: if you don’t like how your voice sounds, modulate it. I think my voice is rather high and a bit nasal. Lately I’ve been trying to drop it and speak more from my chest. I’m always amazed by hearing people speak after I’ve heard them sing. They often sound like two completely different people. Know what you want to say before you start talking. Boy, this is one I learned the hard way. I’m glib. I talk easily (eye-rolling here from those who know me). I can get up and start talking before my brain is fully engaged, and that has gotten me into a lot of trouble. My son with the diploma in Public Relations came to some library appearances I did a few years ago, and the little so-and-so took notes on what I was doing wrong, copious notes. “You’re talking too long and getting off topic. Keep it short and sweet, on topic and people will remember it better.” “Do you know how many times you used ‘ah’?” Etc. Etc. And he had counted my “ahs”. I was appalled, chastened – and very grateful. If you’re asked a question, there is nothing wrong about thinking a bit before you speak. For one thing, it makes you look like a deep thinker and possibly even philosophical. Gather your thoughts for a few seconds, then speak. And don’t ramble! If you’re doing the Dreaded Reading, you have to practise it first. This should be a no-brainer, but I have seen too many authors get up to read, and I know they were deciding what passage to use as they were waiting their turn or driving to the gig. Sorry. That just won’t do. Don’t you want to know what it’s going to sound like? If you do a good job, perhaps people will be more encouraged to buy your book. Hmmm? You’re doing a performance of your book. Make it a good one. Even if you’re not good at this sort of thing, you can learn to do it by practising and listening back then being honestly critical about how it’s coming out. Repeat the process until it’s sounding good. Get out your trusty (trusted?) recorder, read your selection and listen back to it. Are you speaking in a monotone? Can you understand all the words easily? Are you racing through places that could benefit from a little space? Is it clear by how you’re reading dialogue that speakers are changing and where they’re changing (a big problem for a lot of readers). I also don’t read from a copy of my book (although I do generally show folks the cover). I print my selection out in large double-spaced type so that I can see it clearly, even if the lighting isn’t ideal. I also remove stuff that doesn’t add to what I’m reading. If you have a bit of character development or similar material that really doesn’t have much to do with the selection you’re reading, chuck it out! Reading an action scene might be a better choice, rather than a contemplative scene (unless it is really arresting). You also shouldn’t go on for more than a minute or two setting up the scene. The audience doesn’t need to know all the nuances of the characters for your reading to be interesting to them. No matter how badly things screw up, remain pleasant – and helpful. No one likes a prima donna. Unless someone is deliberately trying to mess you up, you’ve just gotta roll with what happens. I’ve shown up at author gigs (usually signings) where they’ve forgotten I’m presenting. Okay. That is a piss-off, but you’ve already driven all that way, it’s better to be the good guy and get something out of it than storming off in high dudgeon. You’ll be surprised how quickly those brownie points will mount up, too. So someone goofed up, perhaps big-time. Have you never done something like that? No reason to rub their nose in it. They probably already feel really bad. It’s called being a pro. Being nice can sell a few extra books and get you support from people who can help you. Bottom line: do you want to be remembered as a good guy or an unpleasant person? Smother your true feelings and smile. It really helps. Aline wrote last week about attending the CWC Conference in Guernsey. I have also just been to a conference, but on a much smaller scale. And it seems to me that these days perhaps the smaller conferences are the way to go. This weekend saw the one day conference titled Capital Mayhem put on by the Capital Crime Writers group in Ottawa. It was small – in one auditorium in a library, with one track of panelling, and great fun. The day was moderated by mystery-lover and Ottawa City Councillor, Katherine Hobbs, and the guest of honour was Peter Robinson. Peter was interviewed by the wonderful Ottawa writer, C.B. Forrest. And then we had panels of Ottawa-area writers on topics such as writing characters, and building suspense (I was on that one, and it was titled Mystery Striptease) an very interesting panel on short stories, and a talk about his job by a crime-beat reporter for a newspaper. All that and coffee and breakfast cakes to begin and a delicious lunch as well. 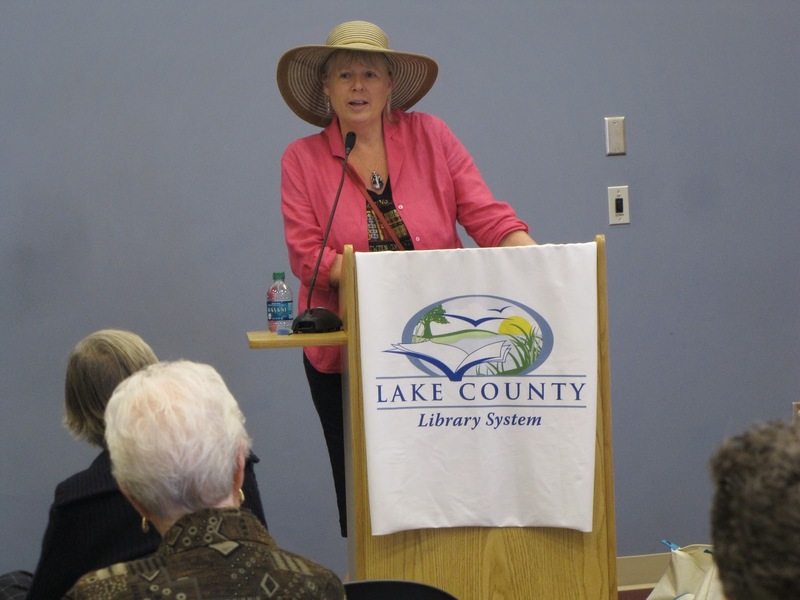 In the US, conferences seem to be thriving – I am just back from Malice Domestic which was as well attended as always, and plans for Left Coast Crime and Bouchercon are well underway. But here in Canada we're faced with the death last year of Wolfe Island's Scene of the Crime and now the last Bloody Words coming up in June. Perhaps smaller, easier to organize conferences such as Capital Mayham are the way to go? Good conferences need someone to step up to the plate and organize them. Writers can't be expected to organize conferences, most of us are just too busy cranking out our books. It's up to fans and readers and lovers of the genre. How about you? How about putting something together in your city? On that note, as I said above, this year's Bloody Words will be the last. Sniff. So, if you have ever thought that you might want to go to Bloody Words someday, you had better make it this year. And Then the Gladiator Said . . .
My next book, due out in Winter 2015, begins with a "gladiator" – a battered urban warrior who wanders into a pharmacy, has an altercation with an automated shopper's aide, then demolishes a display of cleaning products and the security guard with a roundhouse kick. My protagonist, Detective Hannah McCabe, who happens to be shopping for an anniversary card for her best friend, sees this happen and feels obliged to arrest the guy. I got my edits back yesterday with the suggestion that I scrap this scene – in fact, that I scrap my entire first chapter and get to the action. My first thought was that I have action. But the point my editor was making is that my action in this scene isn't related to the plot. The scene with the gladiator could be discarded without damage to the book. No one but me would miss my gladiator if I banished him to the cluttered recesses of my mind. Walking into the book uninvited doesn't mean he should be allowed to stay. I have a month to think about this. I've already figured out how to move one of the scenes in Chapter One involving another detective to later in the book. I've also pointed out that I can't scrap a couple of scenes a few pages later because the alibi for one of the characters is set up there. I can tighten those two scenes and make them work. But it's harder to defend keeping my gladiator. Aside from giving the reader an opportunity to see McCabe handle a tense situation, his scene adds nothing to the book. Before revising, I always turn to books and articles about writing. This is my way of getting my mind working. This time, I'm reading advice about openings – about hooking the reader with the first sentence and keeping her reading through the first paragraph, page, and chapter. The most common advice is that the opening scene should provide an "inciting incident" that sets the plot in motion. This inciting incident is often the "call to adventure" that launches the protagonist on his or her journey. But, of course, in some books, the inciting incident doesn't involve the protagonist directly. My book is a police procedural, I could start with Chapter Two and the character who is soon going to be dead. I could wait until Chapter Three to bring in McCabe among her colleagues at the precinct house. Except, I need to have McCabe encounter another character on Friday evening. Chapter Two with my victim-to-be begins on Saturday afternoon. So I really do need to leave those two scenes at the end of Chapter One where they are. . . But I could delete the gladiator. Except I really like him. And I think he wandered into the book in that first scene of the first chapter for a reason. I just don't know what it is yet. One of the most thought-provoking ideas I've come across about opening scenes – I had heard it before but forgotten – is that the seeds of the ending of the book should be there in the beginning. Ideally, the opening lines of a book not only establish the tone and set up the situation, they foreshadow how the book will end. A lot for a first sentence or even a first paragraph to do. But it's been done and done well. I'm giving this some thought. I know now how the book ends. I can use this opportunity to go back and rewrite the beginning. I don't usually rewrite my opening scene after the book is done. I spend so much time struggling with my opening before I can move on to the rest of the book, that I tend to feel pretty good about how the book begins. This time, I feel good about my scene with the gladiator – but it isn't necessary and could mislead the reader about what to expect. I need to figure out why I wrote it in the first place and make that clear by adding something, or I need to hit "delete" and move on. Except I won't be able to move on until I figure out what's going on in the first chapter. But I'm not panicking. I'll let you know if the gladiator survives the revision process. If he wants to do that he'd better speak up and tell me why he's there.